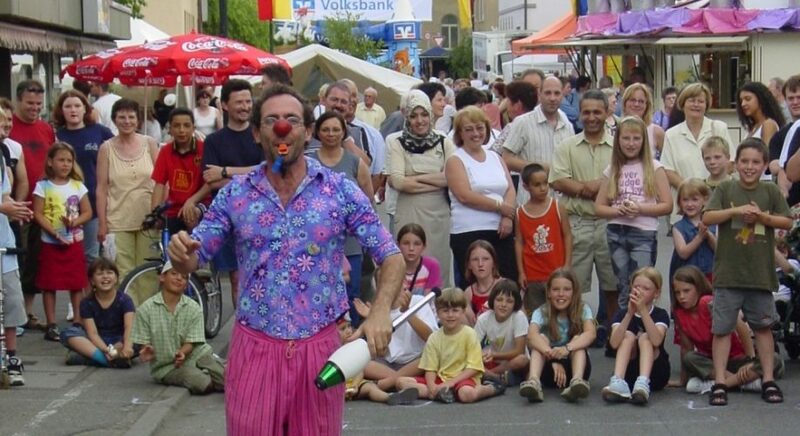 Clown Tom Bolton specializes in entertainment for festivals and events. 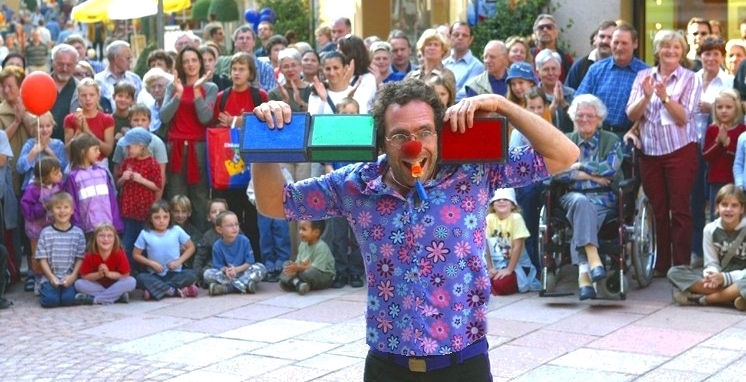 With shows or his unique walk-around entertainment he can bring any audience to laughter. He is originally from the USA but now lives in Stuttgart, Germany. He has worked as a professional performer since the early 1980’s. 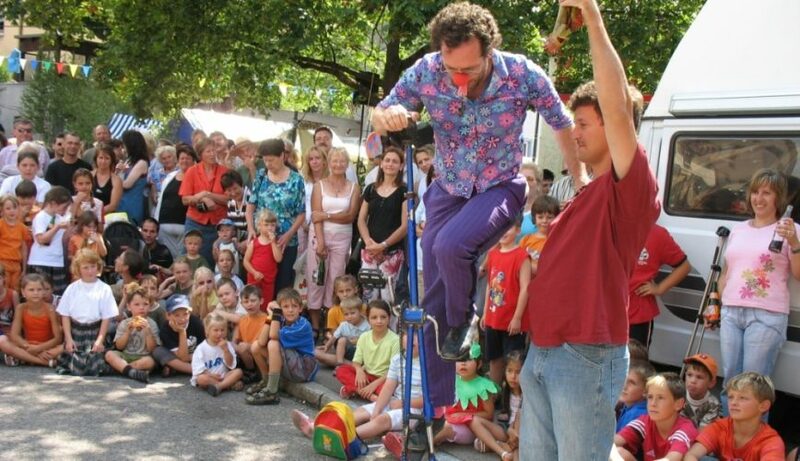 He turned his hobbies of juggling, unicycling and clowning from a hobby to a career. 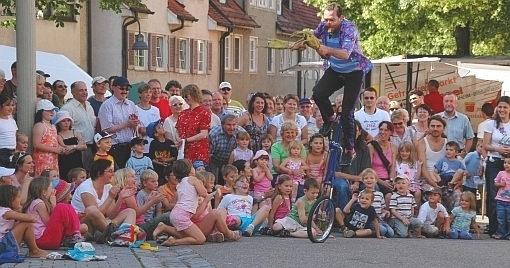 He has traveled in over 50 countries world-wide and performed for people of all cultures. The skills he has learned through his many years of experience make him flexible enough to adapt to almost any performing situation. His specialty is festival entertainment. Typical of most festivals is a constant stream of new visitors. 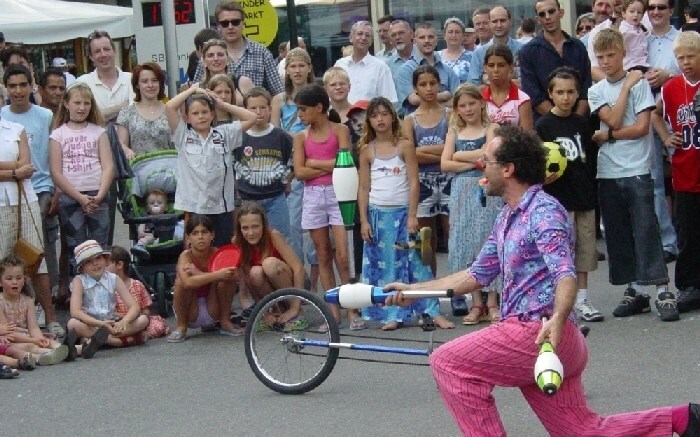 With Clown Tom Bolton’s show he can enchant hundreds, if not thousands of people at the same time, if given enough space. He usually limits a day to 4 shows or 3 shows if part of a long running engagement. Tom is independent. He needs no stage, technicians or special lighting system. He often uses background music but can bring his own portable battery operated sound system. This is adequate for even audiences of 400 or 500 people. Like any performer, Tom prefers not to be blasted out by a rock band right next to him. He does his show without speaking and is not as sensitive to background noise as some acts. Thus he also has no language barriers. Tom suggests that there be a minimum of 45 minutes between shows. He is also able to change his location if necessary. But as the crowds circulate and change, it is much easier for him to find the optimal spot and stay there. This works better for everyone than constantly packing up his props and maneuvering through the masses to arrive at a new spot. Festival organizers should think about where they can best place Tom’s show. He needs people around but the more space – the more people he can entertain. But some festivals are so crowded that a show tends to block the way through. This can become annoying or dangerous. It is better to leave extra performing space than to have too little. Walk-around entertainment, shows or both? Although shows can produce the highest level of atmosphere there are also advantages to Tom’s walk-around entertainment. 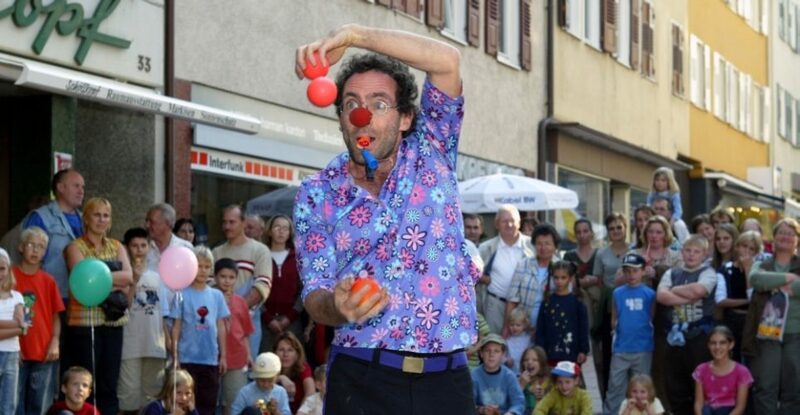 He is mobile and can do his unique clown improvisation and gags in places like between tables where there would be no space for a real show. He approaches individuals or small groups and amuses them with gags that are not presented in his show. He can also combine shows and walk-around. At smaller events there are often limited sized audiences that doesn’t change much over the time. Clown Tom can make a show as a highlight and spend the rest of the time doing his walking act. For many types of events, Tom can also greet the guests as they arrive with his clown-security character or simply nonsense. This not only sets a positive mood but means something is happening before most guests have even shown up.